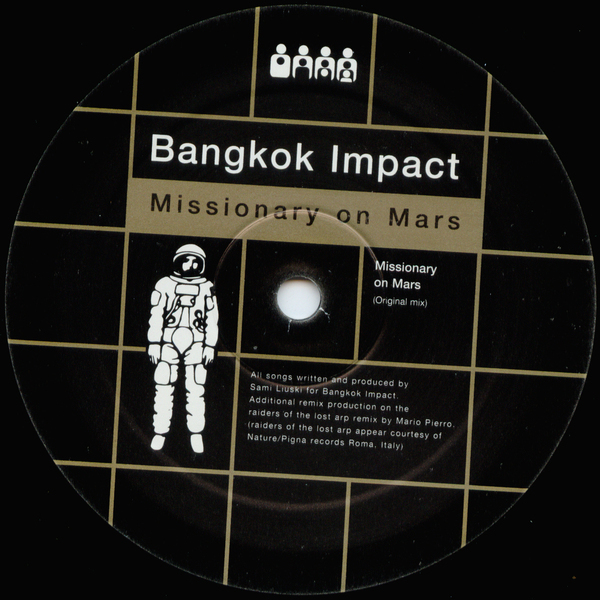 It's been a while since we've heard from Bangkok Impact - but here they are, back with probably their biggest release to date, and clearly one of their most addictive Italo-missives ever. "Missionary on Mars" is just camp as anything, all Moroder stylings and glitterball effects that are rooted deep into the late 70's, a kind of post-discoid anthem complete with a heaving Carl Craig style bassline that sounds so analogue you can't help but give it your respect. The flipside remix from Raiders of The Lost Arp is more robust and determined - a sort of heads-down approach to Italo that works a treat, while the killer "Red Planet" remix is just totally sick - a cavernous Chicago style JACK track that's just about as filthy and padded as you'd hope for - and then some. Ace twelve!